Comes with five MR16 GU10 50 watt bulbs. Measures 8 1/2″ high, 9 1/2″ wide. Sleek, contemporary and supremely versatile, this light fixture has five individually adjustable gooseneck lamps. 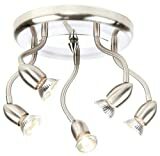 A great choice for kitchen lighting, play rooms, hallways or anywhere you need flexibility in your lighting scheme. Brushed steel finish. Comes with five MR16 GU10 50 watt bulbs (line voltage). Measures 8 1/2″ high, 9 1/2″ wide. When you have remodeled your kitchen and everything is new, don’t forget to choose the right contemporary kitchen light fixtures. Not only will the right lighting enhance the theme of the kitchen, but also puts light right where you need it. The last things you want in a kitchen are dark corners or struggling to peel a potato because of poor lighting. Your kitchen counters, backsplash, island, and breakfast table will likely require different kids of light fixtures. Some areas will call for a light that glows warmly and spread out evenly while others need a more focused type of lighting. If you are planning a kitchen remodel, make sure you include kitchen light fixtures and their placement in the plan. Otherwise, you may end up with problems if you try to adjust the lighting after the remodel has been completed. Instead of only visiting traditional lighting stores you should also browse through online stores to view a wide range of light fixtures for your kitchen. This move will provide you with various remodel ideas if you have not yet started remodeling your kitchen. You will also be able to compare rates and features of various lights so as to get the best possible deal in terms of quality and prices. Most people opt for flushed light fixtures that look as if they are part of the kitchen furniture itself. You can use such lights to focus on specific areas such as your benchtops or countertops. If you have a kitchen island then you need no other excuse to get a wonderful chandelier that not only provides lighting to the island but also provides a warm glow to the rest of the kitchen. You should make sure that you choose a chandelier that offers ease of cleaning as well as ease in replacing blown-out bulbs. Another concept that is slowly gaining popularity in traditional as well as modern kitchen themes is track lighting. Track lighting allows you to fix several types of light fixtures on to one main track and also adjust the focus of each light individually. Such fixtures provide an uncluttered and smart look to your kitchen. You can also opt for pot lights and pendant lights to provide light to specific areas of your kitchen. In addition, if you want to highlight your backsplash or a specific wall of your kitchen or even your expensive new refrigerator then you should install scone light fixtures that provide focused light on the desired area. You can also have dimmers installed on some of these lights so as to light up your kitchen based on your current mood. Your kitchen remodel ideas will surely come to life with appropriate light fixtures fixed at the right locations in your kitchen. Another important part of any kitchen is the kitchen step stool. These are made with a variety of different materials, including wood, steel, plastic, and aluminum. A folding stool is a good choice for small kitchens. Not matter what style you choose, make sure it is sturdy enough to safely support your weight. Your kitchen not only needs to be a safe place to cook in but should also be stylish enough to beckon you day after day. In addition to kitchen cabinets, countertops and cooking ranges, your kitchen also requires the right type of lighting and other accessories so that you can enjoy cooking in your dream kitchen.